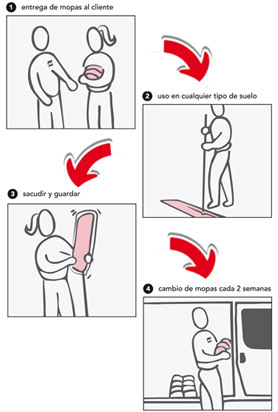 The Mesdi customers can use the specially impregnated mops in form of a service. The service means that the mops are replaced by clean ones regularly, in every two weeks, which includes collection, washing, drying, impregnation and transportation. The user does not have to bear any investment costs, neither do they have to care for regular material purchase, they just have to avail themselves of the service. The Mesdi provides the requested mops according to the contractual terms, according to the requested number and size, together with the structure belonging to it. In the course of the cleaning, you do not need anything, just to push the mop lengthwise on the respective surface. You don’t need to sweep or mop the surface before using the mop we offer. Furthermore, you don’t have to use any water or other chemicals. After the use, we recommend you to remove the surface dirt from the head of the mop, and to keep its long effect, it should be kept airless, tied in a plastic bag. The replacement of the mops is done regularly, in every two weeks.